Built by A.G. Weser of Bremen, NDL's second Berlin was launched in 1908 and made her maiden voyage from Bremen to New York on 1 May 1909. From New York she entered NDL's New York-Mediterranean service, where she remained for the rest of her NDL career. 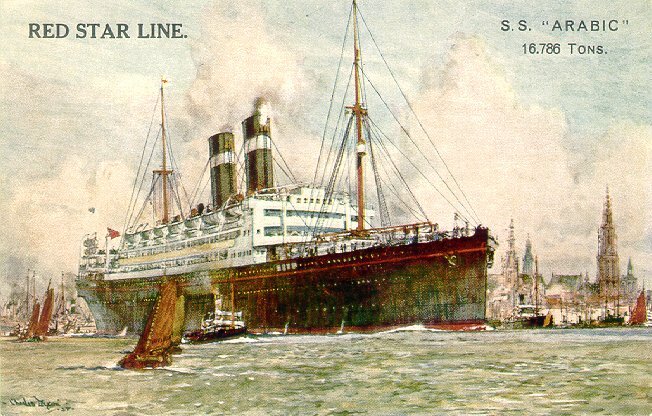 World War I began in August 1914, and Berlin was soon taken over as Auxiliary Cruiser C, fitted as a mine layer and disguised in Anchor Line livery. Among her victims was HMS Audacious, the only British battleship lost to either mines or torpedoes during the war. Several weeks later, Berlin was interned at Trondheim, Norway. 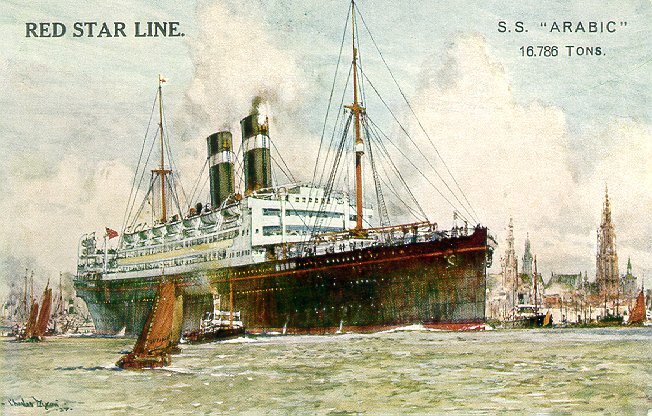 She was ceded to Great Britain at the war's end, and spent most of 1920 as a troopship managed by P&O Lines. 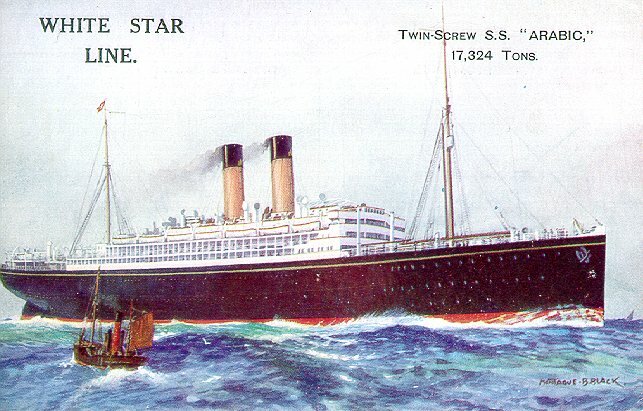 She was purchased by White Star in November 1920 and converted back into a passenger ship, the largest (in terms of passenger capacity) that White Star ever owned. She had accommodations for over 3,200 passengers, 2,700 of them in third class. 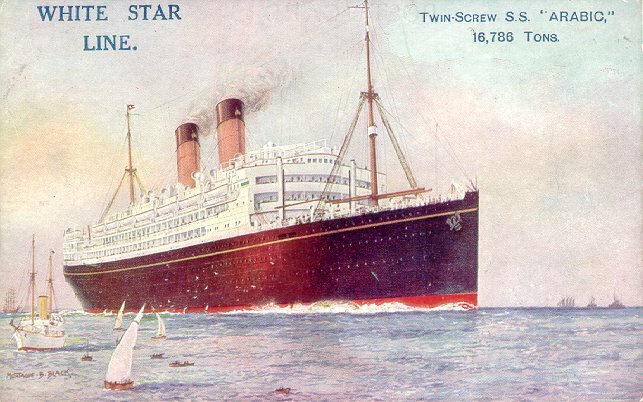 She was given the name of the first White Star liner lost during the war as a result of enemy action: Arabic. Arabic made her initial voyage for White Star from Southampton to New York on 7 September 1921, and from New York joined the line's Mediterranean service. After a 1924 conversion to cabin/tourist/third class configuration dramatically lowered her capacity (to 1,700), she was placed on the Hamburg-New York route. From October 1926 until January 1930, Arabic was chartered to Red Star and used on that line's Antwerp-New York service. She retained her name, but was painted in Red Star colors in April 1927. After returning to White Star, she was again refitted and her capacity fell even further, to just over 1,400. She was placed on the Liverpool-New York route, but made her final voyage on 16 July 1930. Arabic was scrapped at Genoa in 1931. Sources: Haws' Merchant Fleets; Bonsor's North Atlantic Seaway; Cunard White Star Liners of the 1930s.